Non-carbonated soft drink with aloe vera and sweetener. Ingredients: Water, Crushed Aloe Vera (6%), Sugar, Corn Syrup, Pomegranate Concentrate (0.3%), Acidity Regulators (E330, E327, E331), Pomegranate Flavour, Aloe Flavour, Colour (E120), Stabiliser (E418). 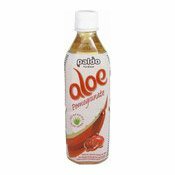 Simply enter your details below and we will send you an e-mail when “Aloe Vera Drink (Pomegranate) (蘆薈飲品(石榴味))” is back in stock!